It was requested to do a post on how to apply false lashes and which lashes in particular are my favorite. Once I started to write about false lashes, I realized that this post was going to be very, very long. So I decided to break it up into three different posts. This post is basic information & common questions regarding false lashes (strip lashes), my second post will be a picture tutorial of how to apply false lashes and my third post will be regarding individual lashes. If you have any questions that you think should be added to this post, comment and I will add your question along with my answer. There are several different places you can purchase false eyelashes. You can purchase them at your local drugstore (CVS Pharmacy, Walgreen’s, Etc), Target, Walmart, Beauty Supply Stores (Sally Beauty Supply, ULTA, Etc.) and more. Walgreen’s & CVS Pharmacy typically carry Modlash by Andrea, Ardell Fashion Lashes, Ardell Natural Lashes, Revlon Fantasy Lengths, Revlon Intensifeye Lashes, & Maybelline Lash Expert Lashes. I’ve also spotted new “Kiss” brand of lashes at my local Walgreen’s. Most lashes range from $3.49 to $6 a pair. I usually find them cheaper at Walgreen’s opposed to CVS and Walgreen’s often has sales on them. Target carries limited styles of Ardell Fashion Lashes, a couple styles of N.Y.C false eye lashes and a few styles of Sonia Kashuk Lashes. It depends on your location as well. Larger Target stores will carry a larger selection. My nearest locations sell Ardell’s for around $3.69 or so a pair. As far I recall, Walmart carries a range of Salon Perfect lashes, which I believe are Ardell/Andrea lashes with a different name sold exclusively at Walmart. I like purchasing Salon Perfect lashes because they are the same as Ardell’s but cheaper! The regular price for a pair is $3 at my nearest location. They also carry Revlon Fantasy Lengths. You will find the largest selection of lashes at your Beauty Supply stores. Sally’s Beauty Supply carries all styles of Ardell and Andrea false lashes, whereas your local drugstores only carry limited styles. Depending on how large your ULTA store is, they may have a decent selection. The ULTA stores near me carry Ardell, and don’t have many styles. Often times they don’t have the style I am looking for. You may be lucky enough to find decent lashes at your local Dollar Store.. I found some great Fashion Lashes at my local Dollar Tree. But, every location is different and certain items sell out quick. So, it can’t be guaranteed that you’ll find them. http://www.madamemadeline.com. The ultimate online store to purchase various brands of false eye lashes. They carry Ardell, Andrea, Eylure, Kiss, Red Cherry, Revlon, Sherani, Gypsy Lashes, Elise & more. Make sure to check out their specials as they have monthly sales. http://www.eyeslipsface.com. If you’re on a budget, ELF has a few different styles of false lashes for $1.00 each. You can also find eyelashes on ebay, your local drugstores website and more. http://stores.ebay.com/mkpinkkitty/. Mkpinkkitty ebay store stocks various brand name false lashes. They offers a good selection. Although I’ve never purchased their lashes before. If you want to share any of your favorite places to purchase eyelashes, post in the comments at the bottom of this post! I usually purchase Ardell and Andrea brand lashes. Since I wear false lashes often, I try and wait for a sale and I will purchase several to have on hand. I purchase Salon Perfect lashes from Walmart often, as they are less expensive. I have never tried Maybelline or Revlon lashes. I’ve tried N.Y.C lashes, but they only have two styles that I don’t care for.. so I don’t purchase them. 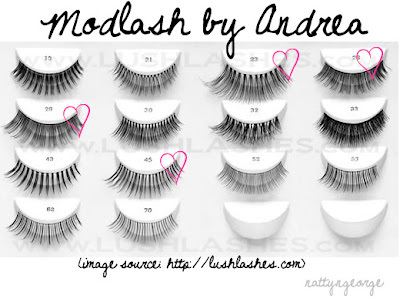 My favorite styles are Andrea Lashes #26, #23 & #28 (A longer version of #26). With all three of those styles, I always cut them in half for a less dramatic look. My favorite styles in Ardell are #105, #111 (very long & dramatic) #119, #107 & Lacies. Sometimes I purchase #103’s. My favorite style in Salon Perfect (Same as Andrea Lashes) are #23, #26 & #45. Ultimately, it’s up to you to choose which you prefer. I like both, but I prefer human hair eye lashes for a few different reasons. Real human hair false lashes are made to better blend in with your lashes and give a more natural appearance. They have more “give” to them than synthetic lashes and can be bent to the shape of your eye to be worn for comfortably. They are also lightweight and should feel comfortable on your lashes. But, these are more fragile than synthetic lashes and you will typically get less uses out of them. Synthetic lashes can be made of various different fibers to best resemble real lashes. They are more stiff and you have to bend them quite a bit to fit to the shape of your eye. Depending on the brand, the band may be very stiff and it may lift off the ends, which would require frequent touch ups. Because they aren’t real human hair, they hold a curl very well and are ideal if you want sky high glamour lashes. Synthetic lashes are typically shiny and can sometimes look unnatural, but once you apply a coat of mascara on them, they will blend in better with your lashes and appear less glossy. 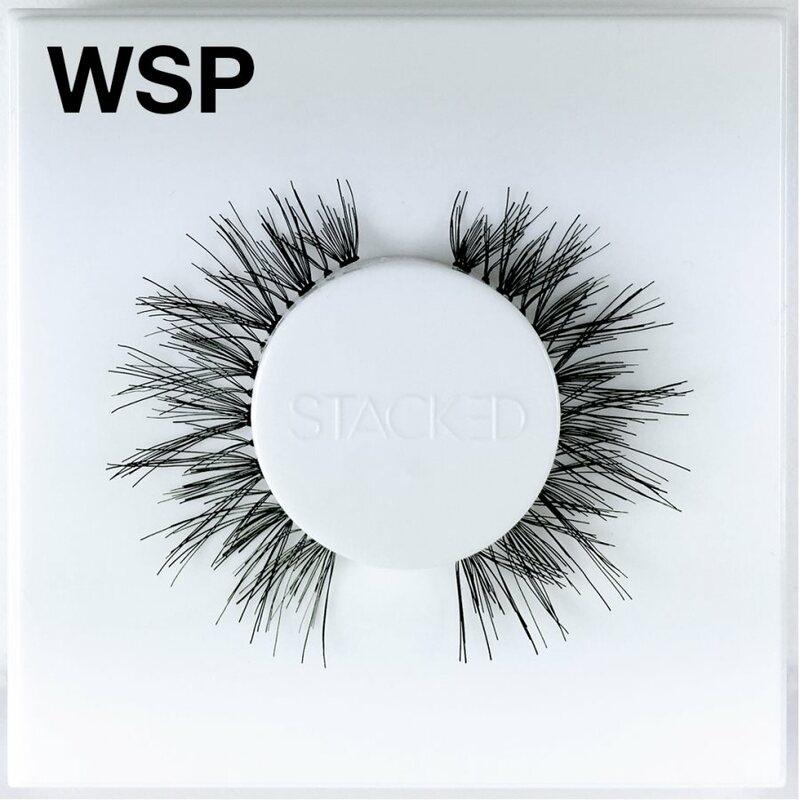 The reason many choose Synthetic lashes is because they are less expensive & they are more durable – which means that they will usually last longer. It really depends on what “look” you are going for. Lashes that are very dark and thick are very noticeable and dramatic. They tend to appear less natural because of the thickness & can sometimes feel slightly heavy on your eyes. Nevertheless, they are beautiful for photo shoots or a night out. I recommend real human lashes if you want thick, because synthetic thick lashes (if they are long as well) appear very shiny, tend to curl very high and unnatural and can sometimes look “drag-ish”. Steer more towards thick lashes with a natural length to add a lot of definition to your eyes. 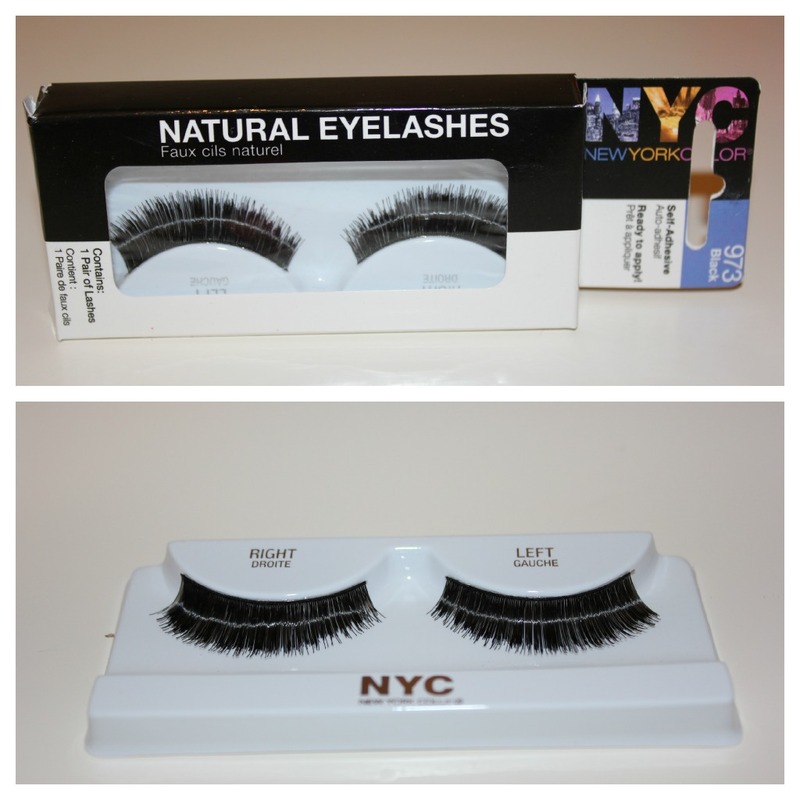 This particular style of N.Y.C lashes are very thick and dark. You can tell that they are synthetic because they are very shiny. They are dramatic, but they aren’t very long – So, they will enhance your eyes and make your eyes look darker and sultry. 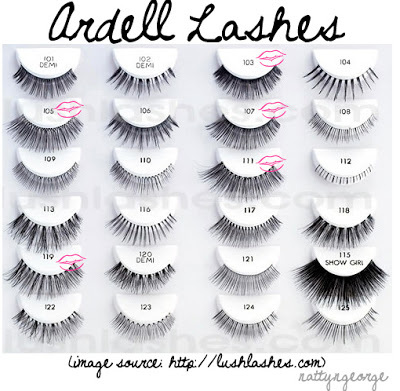 Lashes that are natural in length and volume (refer to the “Ardell” photo above and look at #123 for example) are ideal for those with very short and fine lashes for a natural appearance. The possibilities are endless. You just want to make sure to pick lashes that are longer than your own. I’ve purchased lashes before that were actually shorter than my lashes – but much thicker and once I applied mascara to my lashes, they looked very unnatural. If you can’t decide which to purchase, steer more towards lashes that are more natural in appearance. Then, you will get an idea of if you need more length or volume, so you’ll know what to purchase next time! 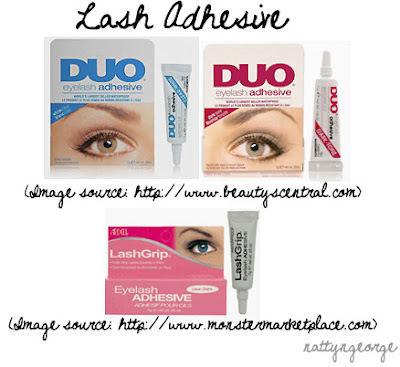 There are two basic brands of Lash Glue most that most locations carry. It is Ardell LashGrip Adhesive & DUO Eyelash Adhesive. I prefer DUO over Ardell because DUO is a stronger glue. I find that when I use Ardell lash glue, my lashes are falling off by the end of the night. That doesn’t happen when I use DUO. DUO comes in two shades of glue, Dark or Clear. The dark glue is gray colored when wet, and dries to black. This is ideal if you are wearing black eyeliner or a black/dark smokey eye. The clear glue is white/off white when wet and will dry clear. Don’t be alarmed by the scent of the glue if it’s your first time applying false lashes. It has a offensive fishy smell, but goes away once it has dried. 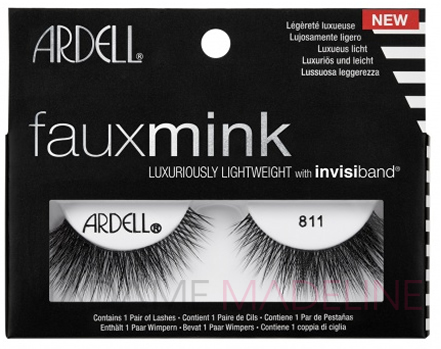 You may also see Ardell Lashtight Adhesive for Individual Lashes.. but don’t purchase that one. It is not for strip lashes. It’s for eyelash extensions. I’ve bought it before on accident thinking I was purchasing regular adhesive. Also, you may find the Ardell glue in a different colored box.. such as yellow, blue, black or pink. It is all the same exact product. There are several ways to clean your lashes. If you have real human hair lashes, they require a very delicate touch to clean. Apply a few drops of water to them and comb them through with a lash comb to get rid of any dust, dirt or mascara. It should also soften the glue so you can pull it off easily. Let them dry flat overnight. If they are drenched in water and you let them sit, the lashes can get clumped together and will stay that way. Synthetic lashes are easy to wash. You can run them under lukewarm water and with your fingers lightly rub the lashes so any mascara or dirt runs free. Lay them on a flat surface to dry. It mainly depends on how well you take care of them. If you don’t apply mascara to them or curl them with a lash curler, it will extend the life of your lashes. Make sure to always take them off at the end of the night and don’t sleep with them. If you sleep with them, you may wake up to your lashes being pressed in different directions and you won’t be able to wear them again. Gently peel them off at the end of the night and store them in the plastic container you purchased them in. It’s important to keep them in a closed place because if you put them on your nightstand, they will collect dust and particles over night. I typically get 3 or 4 uses out of them. Sometimes I can get 5-7 uses out of them if I take extra care of them or if they are synthetic.